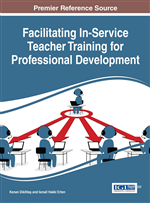 This chapter focuses on the impact of technology on teacher training through online communities of practice (CoP) and investigates its potential for facilitating continuous professional development for the educators who can create personal learning networks on the web. Wenger's Community of Practice Theory (1998) and Garrison et al. 's (2000) Community of Inquiry (CoI) are explored as underlying theories of CoP. Furthermore, examples of online communities of practice will be briefly enlisted. The chapter will provide brief information how online learning is operationalized within the confines of CoP. The chapter will also discuss role of online communities of practice for teachers' continuous professional development with reference to current literature, explore challenges and focus on suggestions and avenues for further research. Teaching requires teachers to be life-long learners to cater for the demands of continually changing terrain of educational contexts in the digital age. Being responsible for preparing their students to live and work in the changing world, teachers are required to sustain professional development to further their knowledge in a variety of areas including content, general pedagogy, curriculum, learners and their characteristics, educational contexts, educational purposes, values and aims, technology and pedagogical content knowledge. Therefore, many teachers take part in professional development endeavours to extend their knowledge and cope with shifts in education due to widespread diffusion of high speed internet and Web 2.0 tools. Educational technology provided educators with an innovative virtual means for professional development and collaboration. Many communities of online practice have ensured platforms in which geographically dispersed teachers can collaborate with others in sharing knowledge and exchanging their expertise through Web 2.0 tools, blogs, wikis, online discussion forums, e-mail list servers and social media tools. Consequently, members from diverse organizational and cultural backgrounds engage in professional dialogue extracting, creating and exchanging knowledge in order to help each other solve problems, tell stories of personal incidents and debate issues of shared interest. Therefore, online professional learning and the community of inquiry framework have important theoretical and practical implications for teacher development. This chapter is in pursuit of discussing affordances of CoPs and CoI framework for teachers’ continuous professional development (CPD) and showcase some CoPs for the networked teachers.